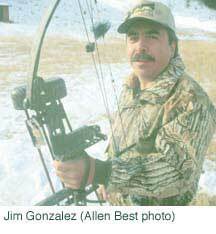 Jim Gonzales lives in Minturn, Colo., and grew up hunting elk, deer and grouse with his father, who mined zinc and lead at the now-defunct Eagle Mine, near Vail. He prowled the backcountry roads in a four-wheel drive until two decades ago, when a landowner who controlled access to their favorite hunting area denied motorized use. "Everybody laughs. Nobody gives a damn about the Forest Service. They have not, to my knowledge, given a ticket to anybody." The Forest Service, he charges, caves in to ski-area operators and other special interests. "They're not good stewards of the land in this county." The Forest Service's preferred alternative cheers him, but not much. He expects the agency will capitulate to ski areas and other moneyed interests. "I think the (agency) threw this out to make themselves look good, and then later they'll back down. I think they did this as a political thing, to save face."